Chocolate and Banana Boobie SmoothieBoost Your Milk Production Now! This Chocolate and Banana Boobie Smoothie is a must try for breastfeeding mums! If you want something delicious to drink whilst boosting your milk supply, why not try this delicious Chocolate, Peanut Butter and Banana Lactation Supporting Super Smoothie! This Chocolate and Banana Boobie Smoothie is full of good stuff! Both oats and flax seeds are known to boost milk production, while peanut butter is a wonderfully satisfying protein for hunger. Remember, nourishing yourself is as important as nourishing your baby! 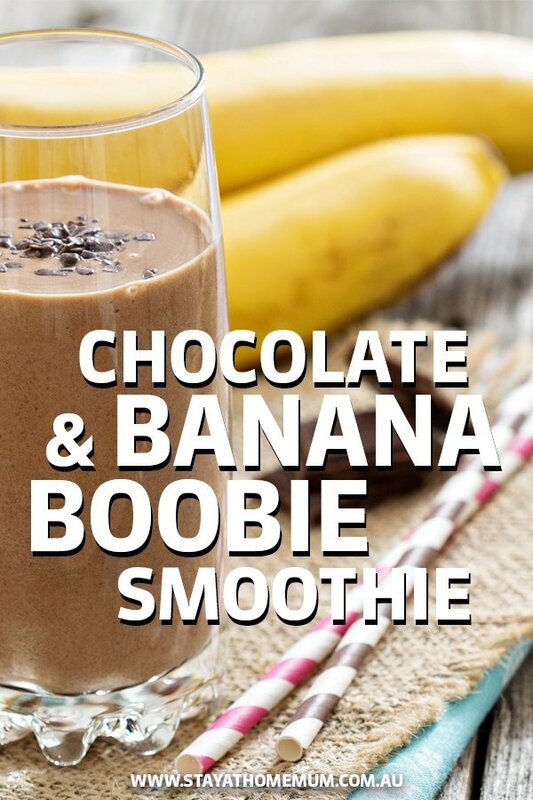 Whip up this Chocolate and Banana Boobie Smoothie right now! Pop the oats and the flax seeds into the blender and give them a few pulses to break them down. Add everything else into the blender and blend until well combined. Add in the ice and blend until well blended. Depending on how you like to enjoy your smoothie (i.e. with a spoon or a straw) add more ice.